Kyntheum (brodalumab) injection is now available for the treatment of moderate to severe plaque psoriasis in adults who are candidates for systemic therapy. Brodalumab is a recombinant human monoclonal antibody and the first biologic to target the IL-17 receptor subunit A. It differs from existing biologic therapies for psoriasis as it specifically binds to the receptor on skin cells rather than targeting free-floating inflammatory mediators. By binding to IL-17RA, brodalumab blocks the biological activities of the pro-inflammatory cytokines IL-17A, IL-17F, IL-17A/F heterodimer and IL-25, resulting in inhibition of the inflammation and clinical symptoms associated with psoriasis. The recommended dose of Kyntheum is 210mg administered by subcutaneous injection at weeks 0, 1, and 2 followed by 210mg every 2 weeks. 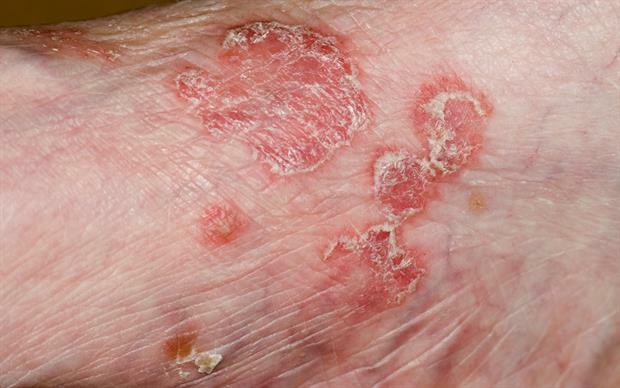 The AMAGINE trial programme involved 4373 patients with moderate-to-severe plaque psoriasis. AMAGINE-1 was a double-blind, placebo-controlled study in 661 patients. Investigators found that brodalumab therapy was associated with significant clinical benefit, with 83% of patients treated with the 210mg dose achieving a 75% improvement in Psoriasis Area and Severity Index score (PASI 75) at week 12, compared with 3% of those who received placebo (p<0.001). The other co-primary endpoint, a static Physician's Global Assessment score of 0 or 1 ('sPGA success') at week 12, was achieved by 76% of patients in the brodalumab 210mg group and 1% of those in the placebo group. AMAGINE-2 and -3 were large, replicate, multinational studies that compared brodalumab with ustekinumab, a monoclonal antibody against interleukin-12 and interleukin-23. Results showed that the PASI 75 response rate at 12 weeks was higher with brodalumab 210mg than with placebo (86% vs 8% in AMAGINE-2 and 85% vs 6% in AMAGINE-3; p<0.001), as were the rates of sPGA success (p<0.001). Patients treated with brodalumab also had significantly higher rates of complete skin clearance (PASI 100) at 12 weeks than those treated with ustekinumab (44% vs 22% in AMAGINE-2 and 37% vs 19% in AMAGINE-3; both p<0.001). Overall, more than half of patients on continuous brodalumab treatment in the AMAGINE trials achieved PASI 100 at week 52. Patients also reported improved health-related quality of life after 4 weeks of treatment with brodalumab. After 12 weeks of treatment, 7 in 10 patients reported psoriasis no longer impaired their health-related quality of life. Brodalumab was well tolerated in all trials with an acceptable safety profile. The most commonly reported adverse reactions were arthralgia (4.6%), headache (4.3%), fatigue (2.6%), diarrhoea (2.2%), and oropharyngeal pain (2.1%). 'Lasting skin clearance is our ultimate treatment goal for psoriasis patients, as it has such a significant impact on an individual’s wider wellbeing, along with their physical health,' said Professor Dr. Ulrich Mrowietz from the Psoriasis Centre at the University Medical Centre of Schleswig-Holstein, Germany.